What are the Pros & Cons of Kissing? Ask your Douglasville Dentist! We all know that February is the month when we all feel a bit more in love. We hug more, cuddle more, and kiss more. At the Douglasville dental office of Dr. Jim Williams, we’d like to take you away from your partner for just a minute to talk a bit about the pros and cons of kissing, and how it can affect your oral health. When you want to know more about kissing, your dentist in Douglasville may not be the first person you think to turn to for advice. But we’re the experts in everything oral health related so there’s actually nobody better! Does that mean we recommend no more kissing? Of course not! But we do recommend keeping your mouth healthy and free of gum disease and dangerous bacteria that can be easily transferred from one person to another. The best way to make sure your mouth is kissable is to keep up with your professional cleanings and checkups with your Douglasville dentist. If you’re in need of a cleaning or checkup during this kiss-filled holiday, call Dr. Jim Williams today! Every year on February 9th, we commemorate National Toothache Day. And while having a toothache is no holiday, being toothache free is something we can definitely celebrate. 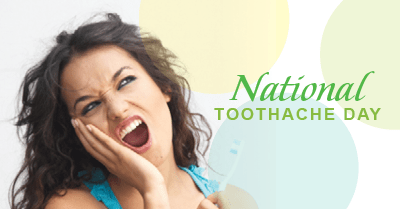 The Douglasville dental office of Dr. Jim Williams likes to use National Toothache Day to remind all of our patients how to stay toothache free and why keeping up with your dental care is so important. In addition to your at-home hygiene routine, keeping up with professional cleanings and checkups with Dr. Jim Williams in Douglasville is just as important for a toothache free mouth. Professional hygiene visits take your teeth to a whole new level of clean, and our hygienists work deep below the gum line to remove anything you may have missed. Your regular checkups are also a great time for Dr. Jim Williams to catch any potential problems before they turn into major issues. If you are experiencing a toothache in Douglasville, don’t wait for the pain to pass. A toothache is your body’s way of telling you that something’s not quite right, and you should listen. Don’t live with the discomfort of a toothache. Give Dr. Jim Williams a call and we’ll work together to determine the cause of the pain and get you back to being toothache free and smiling.